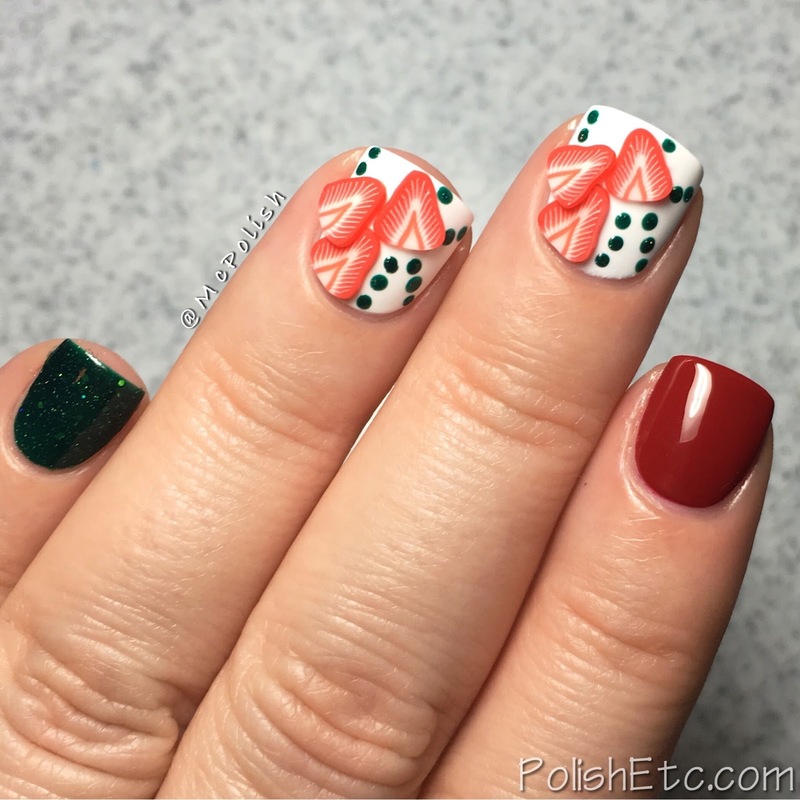 Red Nails for the #31DC2016Weekly - Polish Etc. Today is the first day of my weekly version of the 31 Day Nail Art Challenge. Each Saturday I will be posting a manicure inspired by the 31 prompts in the challenge. See my previous post about the #31DC2016Weekly here. This challenge is to push me back into doing more nail art. I have seriously slacked off of my nail art game for the past several months and I want to remedy that. Doing challenges like this also forces me to think out of the box and to use some of my nail art supplies that I have ignored. For the prompt, Red Nails, I decided to break out the many baggies and nail art wheels of fimo. Honestly, I have never actually used fimo in a nail art look before even though I have a good number of them. 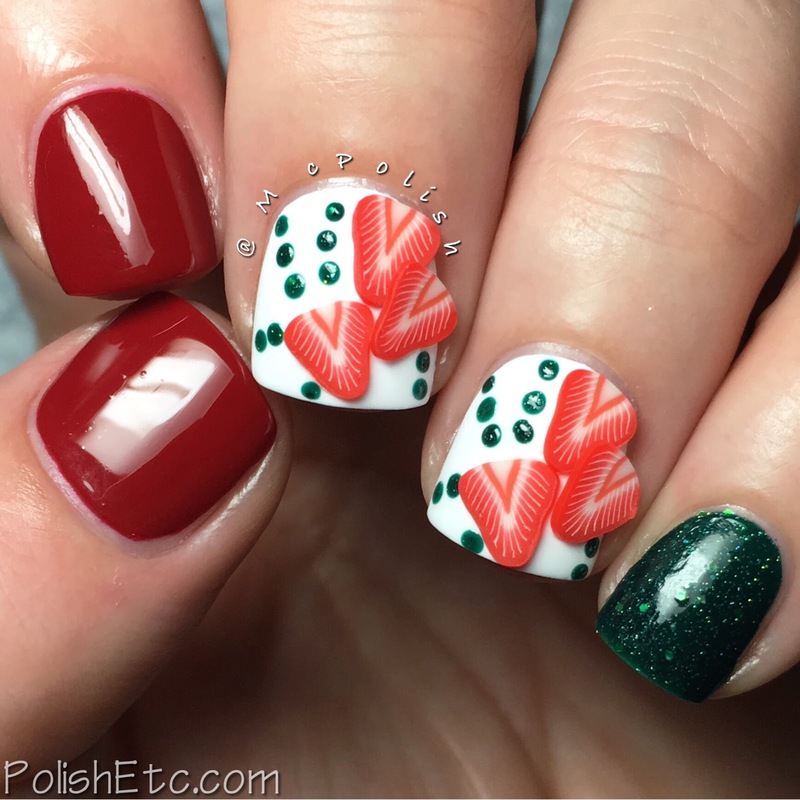 So, I picked out some little strawberry slices and created this skittlette mani! The red creme polish is Mary Kay "Radiant Red" and the sparkly green is Lavish Polish "Guardian of Thunder" (read my review of this polish here). The strawberry slice fimo was from a little wheel of fimo fruit that I picked up from 5 Below. This is a simple look but I am easing back into the nail art world. Fair warning...be prepared for a lot of skittlettes. I just love doing them and they allow me to use several polishes in one mani. Yay! First prompt is done! Next week we will have a look at Orange Nails. If you are joining in on my weekly journey, go ahead and leave your blog name in the comments so I can go check out your looks each week. 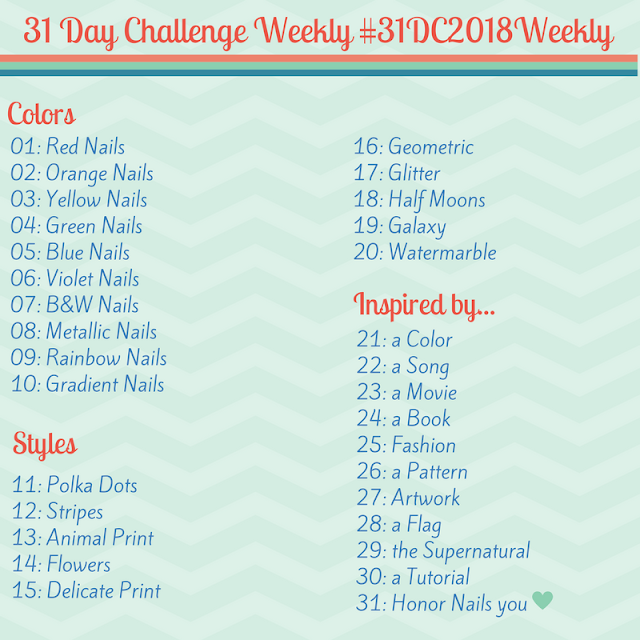 If you want to see everyone else's manicures for this weekly challenge, check out the tag #31DC2016Weekly on Instagram, Twitter and Facebook. The strawberries are so cute! :) I have those as ear studs (also have kiwi slices ^^). And I love me a good skittlette! I think I have some kiwi fimo, too! Maybe a little #mynailsandmyearrings?